BEST Yellow Cake with Frosting - Kosher In The Kitch! 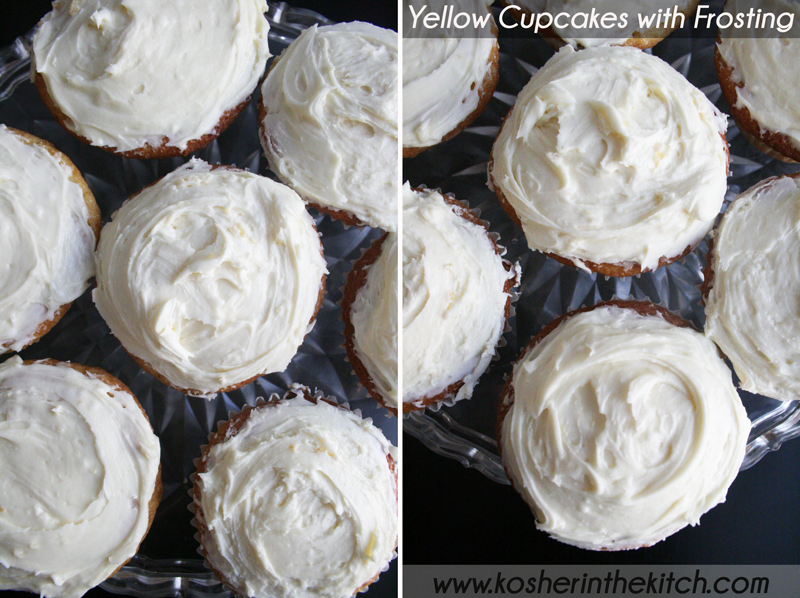 BEST Yellow Cake with Frosting - Kosher In The Kitch! Get inspired in the kitch! Search the site for delicious recipes. Growing up we always had baked goods waiting for us when we got home from school. To say my mom’s a baker is an understatement. She is the Queen of cakes, danishes, cookies and all things sweet. This is her yellow cake recipe. It’s a classic and staple for birthday parties, Shabbat dessert and those rainy afternoons you want to make cupcakes just because. You can bake it as a cake in a 9×13 pan, make a layered cake using two small round pans or serve them as cupcakes. Top them with the rich buttercream frosting for an even tastier treat! I made 12 regular sized cupcakes and 17 mini cupcakes with this batter. I baked some with chocolate chips and baked some without and then added jam filling to them after they were baked. I topped them all with the buttercream frosting. Cream together and blend until smooth. 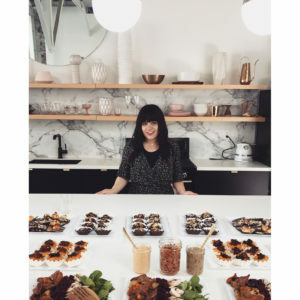 Nina Safar is the founder and foodie of Kosher in the Kitch! She started her blog in search of the best recipes and realized, you don’t need to be a chef to cook a good meal. With the right recipe, or blog, you can enjoy delicious cuisine right from your home! Browse through the site to find your next favorite dish. Hi Yellow cake recipe looks good but not sure what 1 cup oj is? Orange juice??? Hi! Yes, oj stands for Orange Juice. Thank you for this recipe! It really is delicious. I made it in a number one shaped pan a few weeks ago, and now I’m planning to make it for the next birthday kid! I had lost the recipe- I knew I wrote it down but couldn’t find it so I quickly searched for parve yellow cake and found it. Phew. BH. So I had to leave a thank you. So happy you like it! It’s a fav of mine as well. I like to switch it up by adding blueberries or chocolate chips to the batter. So yummy! So happy you like it! It’s one of my favs. 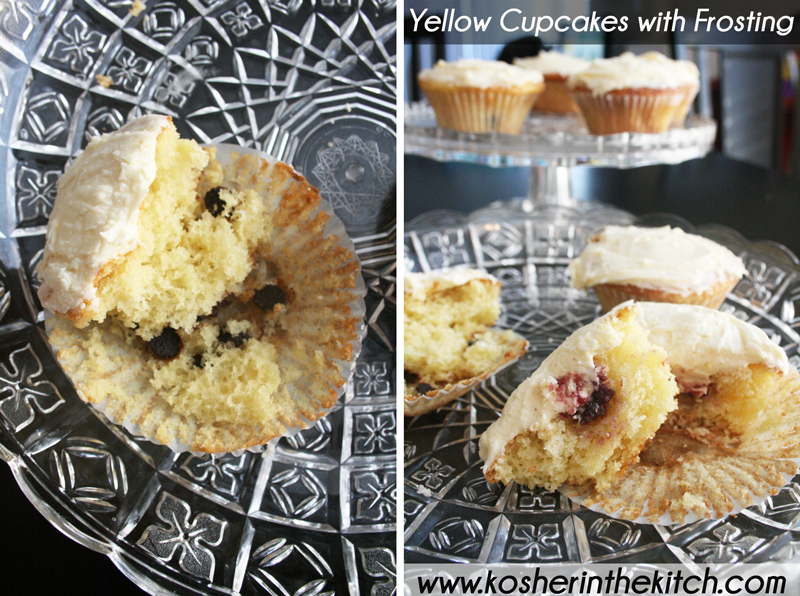 I often add berries such as blueberries, strawberries, raspberries or blackberries to center of each cupcake. You can also add Kosher certified cookie butter, chocolate chips or chocolate spread as a filling. Thank you for the most heaven recipe! I made this for my daughters birthday party. I made it the cake in 2 layers w/ choc frosting in between and around. it was cute and really yummy! Kids and adults licked there plates clean! this was the best tasting birthday cake i ever tasted! Happy birthday to your daughter! I am so happy you enjoyed the cake, it’s one of my favs too! these sound great – Can I use coconut oil for the oil? Hi Ilana! I have not tried it with coconut oil but if you have success baking with it give it a try. Let me know how it comes out! Can I make this with something else instead of orange juice? Hi! Yes you can swap it for cows milk if you want it dairy or almond milk or soy milk to keep it non dairy. This is a great yellow cake recipe! I used it as my base for a pear upside-down cake…and it came out amazing….I made it again! Thank you Google for bringing me to this page when I searched for ‘parve yellow cake”. Hi Chaya! I am so happy you liked the recipe. It’s a family fav! I use it as the base for many of my dessert recipes such as strawberry cake, blueberry crumb muffins and lotus cupcakes. You can add anything to the batter and it’s delicious. Hi, Found your recipe while doing research for a dairy free vanilla flavored birthday cake. I opted to use yours. My mother-in-law will be turning 100 years next week and she is lactose intolerant. The cake is next in line to be prepared. Thank you. Hope it comes tasty and appealing for the rest of the family. Sounds delicious!! !How can I make this into marble cake?? For the yellow cake and chocolate cake, do I use regular flour or cake flour? WOW! 72? I have will have to make it again and test out the amount it makes. Hope you enjoyed it! Kosher in the Kitch Cookbook: Rush Hour Dinners!